Do you make needle or wet felted Christmas decorations for your home? 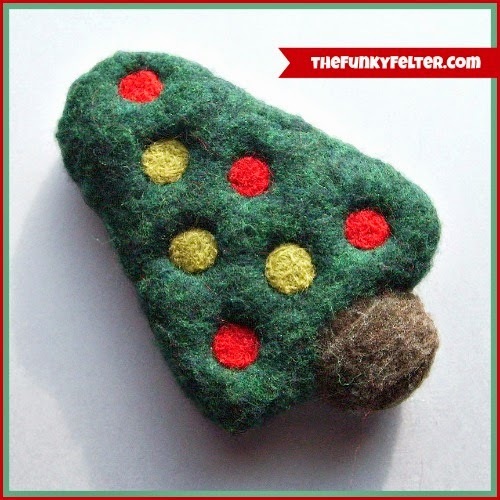 Over the past several years, I have crafted many handmade felted wool holiday decorations. Some were sold in my Etsy shop and some were sold at craft festivals, but some I kept for myself to put out each year. This is one of those little felted wool creations that got stashed away. This felt Christmas tree was created through both needle and wet felting. I used a triangular foam base. Then I lightly needle felted crisscrossing layers of wool roving around the base in green for the tree and brown for the trunk. After tacking it in place, I wet felted it all and let it dry. Then I used a cookie cutter to needle felt the circular ornaments onto the dried wet felted base. It took a few steps between needle and wet felting to create it, but well worth the effort. When I made these to sell online and at shows, it was much easier to make at least a few at once and do each step process to all of them at the same time. Have needle or wet felted any holiday decorations yet this year? Or in a previous year? Please share links or your own inspiration in the comments! CLICK HERE to see a little needle felted elf holiday decoration with tutorial from last year. It shows the basic technique for felting over a foam base as used in this felted wool Christmas tree craft.